With intense drought in Sao Paulo and California, devastating floods in Malawi, and escalating water-energy confrontations in many developing countries, it is no wonder water is making headlines. It’s also gained the attention of the World Economic Forum (WEF), which lists water crises as the world’s number one risk in its recently released Global Risk Assessment. The report, released for the tenth year in January, discusses the world’s top 28 risks as determined by 800 “global experts,” including leaders from the business community as well as the public sector, academia, and various international governmental and non-governmental organizations. The report ranks the risks in terms of their combined likelihood and potential impact. Each risk is then divided into one of five categories: societal, economic, environmental, geopolitical, and technological. While water, a societal risk, gained the top spot for the combination of its impact and likelihood, it was also number one in the “impact” category. Interstate conflict was considered most likely. 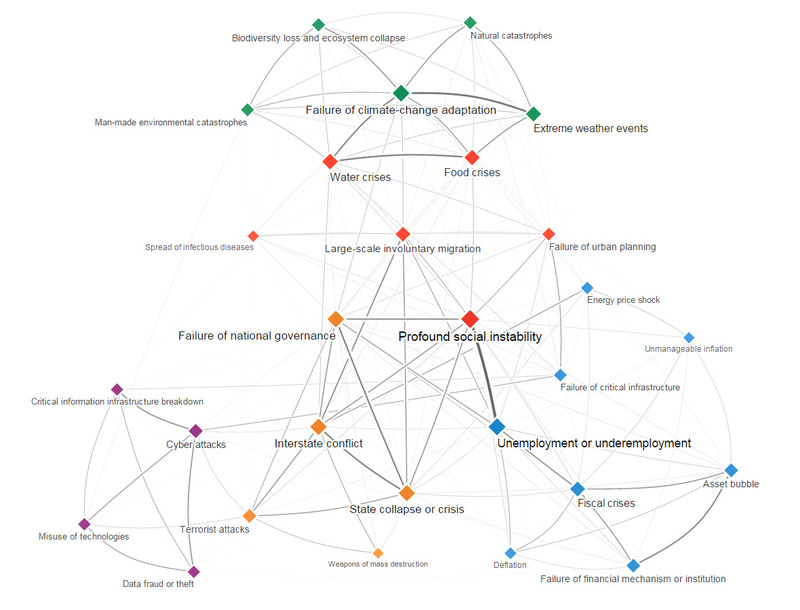 The report highlights the interconnections of risks, showing how global crises relate to and often exacerbate one another. For example, the report ties water crises to environmental risks, such as food security and failure to adapt to climate change, but also to other societal risks such as failures in urban planning or large-scale involuntary migration. Climate change is framed as an “environmental” risk in the WEF report, but it can easily be considered an economic risk, with sea-level rise posing a threat to coastal infrastructure. It can also be seen as a geopolitical risk in the case of conflict over resources, or even as a societal risk if one considers how food and water security affect social stability. Categorizing climate change as a risk, Werrell and Femia write, requires a more nuanced approach. Social Instability and Unemployment From…Aging? The Global Risk Assessment does take a new approach in this most recent addition by drawing “critical distinctions” between risks and trends. Where risks are defined as uncertain predictions, trends are seen as patterns that can amplify or prevent the risks from happening. For example, climate change and urbanization are identified as trends that contribute to the risks of food and water crisis. While aging is a concern for some developed countries, there has been no evidence of this rather new demographic phenomenon leading to instability. Meanwhile, youthful populations are excluded as a trend, despite describing many of the most violent states today and being a major focus among demographers, especially in relation to conflict and state collapse. An additional map depicts the risks survey respondents believe their respective regions are most unprepared for. Water crises are of most concern in North Africa and the Middle East, while fears of failure to adapt to climate change and man-made environmental challenges characterize parts of North America and the Pacific. Sources: Center for Climate and Security, World Economic Forum. Video and Image Credit: World Economic Forum.